A quick Google search into Uganda’s refugee policy and you will find yourself eye-to-eye with the world’s most refugee-friendly country. Headlines praising Uganda’s ultra-progressive refugee policy tell the stories of humanitarian workers entering the beautiful rolling green hills of refugee camps along the countries’ northern border with South Sudan. 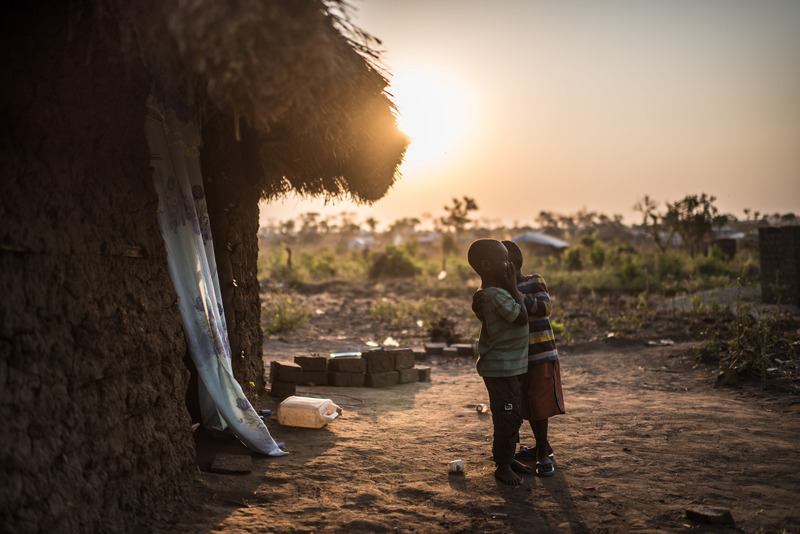 These camps are described as small villages lost in between mango trees and cotton fields, where refugees are received with open-arms and are immediately immersed in Uganda’s proudly liberal asylum policy. While Uganda’s continuous effort to revise their refugee policy is remarkable, labeling the livelihoods of war-displaced populations as paradisiac is a gross embellishment. Uganda is not a refugee paradise; in fact, it is also one of the poorest nations in the world with a settlement system that is crippled by structural underdevelopment and poverty. In this article, we’re going to take a closer look at Uganda’s refugee policy and question why press coverage obscures a reality that is far from paradisiac. Designed in 1999, the Self-Reliance Strategy (SRS) was created by the government of Uganda and the United Nations High Commission for Refugees (UNHCR) as a developmental response to refugee management. In theory, the SRS had two objectives – on one hand, it aimed to empower refugees and nationals in order to nurture mutual support, and on the other hand, it meant to align the services provided to refugees with those of nationals. It also paved the way for Uganda’s 2006 Refugee Act, which recognized the right for refugees to work and move freely around the country whilst living communally with local Ugandan residents. Essentially the UNHCR funds the first steps of refugee self-sufficiency and foresees their integration into Ugandan society and its economic market. Families are given food rations, plots of land for housing and cultivation practices, along with access to health and education services. However, once the family reaches a point of self-sufficiency, wherein they are able to participate in the country’s economy with agricultural trading and cultivation, humanitarian aid and food rations aren’t supplied anymore. On paper, Uganda’s Refugee Act seems ideal – refugees are openly welcomed, offered a safe place to stay and given opportunities to integrate into their host community, and this is precisely the narrative that is promoted in press coverage. The limitations of this policy are far from any reality covered in the media. Forgetting the fact that refugee camps and humanitarian aid are currently stretched to their very limits with over 1.2 million refugees on Uganda’s northern border, the basis of the Self-Reliance System is crumbling. The lands allocated to refugees are located in remote settlements, with little to no access to economic markets and transport systems. Freedom of movement is also only permitted within the confinements of agricultural settlements and is strictly regulated through governmental control. Refugees who do decide to leave the settlements are suspended from humanitarian aid. In reality, Uganda’s local refugee policy does not favour the integration of refugees into their country but reflects the governments’ primary interest in national security and refugee governance. Furthermore, the integration of refugees into Ugandan society has also proved to be inefficient. Initially, it was assumed that once refugees were assigned land and settled in, they would successfully integrate. This assumption is flawed and neglects the complexity of local settlement and refugee identity. At the center of this problematic lies the overreliance of aid agencies on a refugee-centric approach. With employment opportunities and agricultural land offered to refugees, poorer members of the host communities were badly impacted. Resentment and competition completely halted the integration of refugees in Ugandan communities. It is also important to note that Uganda’s refugee policy is highly contingent on the help and funding of humanitarian agencies. This poses a number of problems for both refugees and the Ugandan economy. The Ugandan refugee policy raises many issues with regards to relief economics. By providing refugees with land and agricultural employment opportunities, humanitarian agencies are fostering a dependency on the aid industry. In refugee settlements, economic activities and services are supplied and managed by agencies. In fact, the UNHCR and the refugee program is probably the largest employer in the region. This has created a situation where local economies are influenced and sometimes obscured by the relief economy. What will happen when humanitarian agencies decide to scale down their efforts and leave the program to function on its own? Not only will refugees struggle to survive on their crops, but the Ugandan government will also face a huge dent in its economy. After looking through the cracks of Uganda’s Refugee Act, it is apparent the agricultural settlements they offer as a result of the Self-Reliance Strategy are not a refugees’ paradise, as would falsely indicate Western and Ugandan press. On one hand, it’s interesting to observe Western media pushing for the success story of an underdeveloped African country, when our governments struggle to partake in the refugee crisis themselves. While it is true that positive coverage makes us wonder why our developed countries scramble to achieve a similar policy, in doing so the media is also lifting pressure off the shoulders of European countries. In fact, Uganda’s “success story” shows that African countries are able to host refugees, which in turn justifies the decision of governments to withhold migrants from crossing into EU borders. Lastly, and perhaps more interestingly, is Uganda’s press coverage of their refugee camps. Even though most articles now recognize the mistreatment of refugees and the limitations of their policy, it was not so long ago that Uganda was described as a “major safe haven” for refugees in the African continent. Positive press has effectively allowed the government to deflect from its semi-authoritarian tendencies and its involvement in the South Sudanese conflict. By presenting itself as a hospitable country, simply accomplishing its moral duties, attention is displaced from the fact that Uganda’s support of Salva Kiir also plays a large role in South Sudan’s civil war and subsequent refugee crisis. Overall, I am not claiming that Uganda’s refugee policy is entirely flawed. With over 1.2 million refugees from many of its neighbouring countries, Uganda’s initiative must be recognized and accredited. However, the embellishment of a refugee crisis in the midst of an undeveloped country is worthy of critique. No, refugee paradise does not exist; only the frail tents of humanitarian-led settlements do.